A step-by-step guide to creating your ultimate Thanksgiving mash — from chunky skin-on varieties to the creamiest mashed potatoes you've ever had. Mashed potatoes are one of the most beloved Thanksgiving side dishes, but they're also one of the easiest to mess up. Sometimes they're too wet, sometimes they're undercooked — they're not as simple as they look! 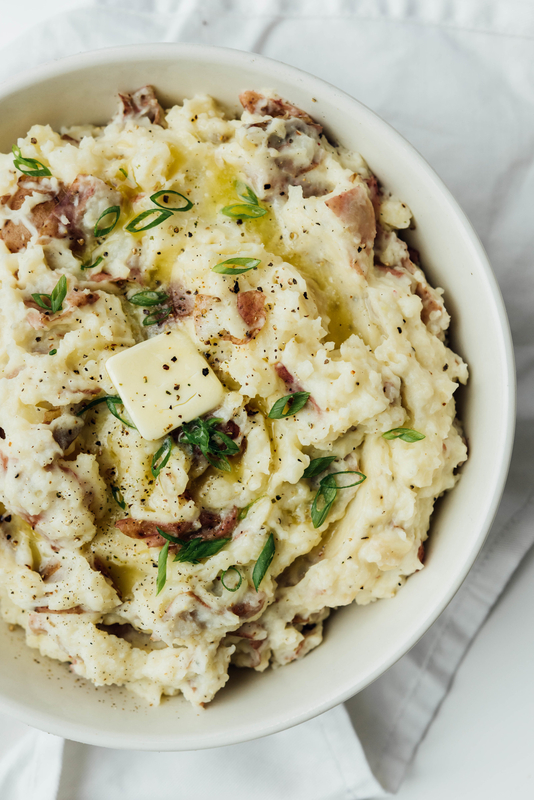 So we decided to create a step-by-step guide that will help you make the mashed potatoes of your dreams. 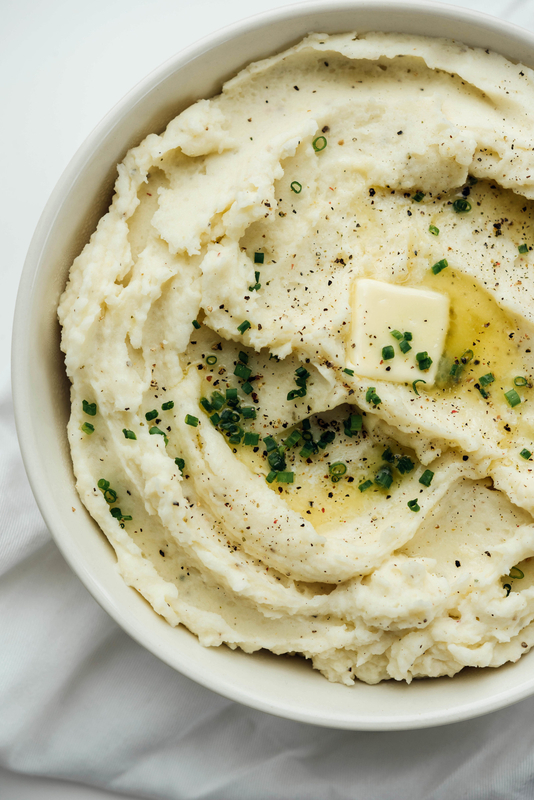 To get started, we identified the four most popular styles of mashed potatoes — then we put together a simple guide for perfecting each one. 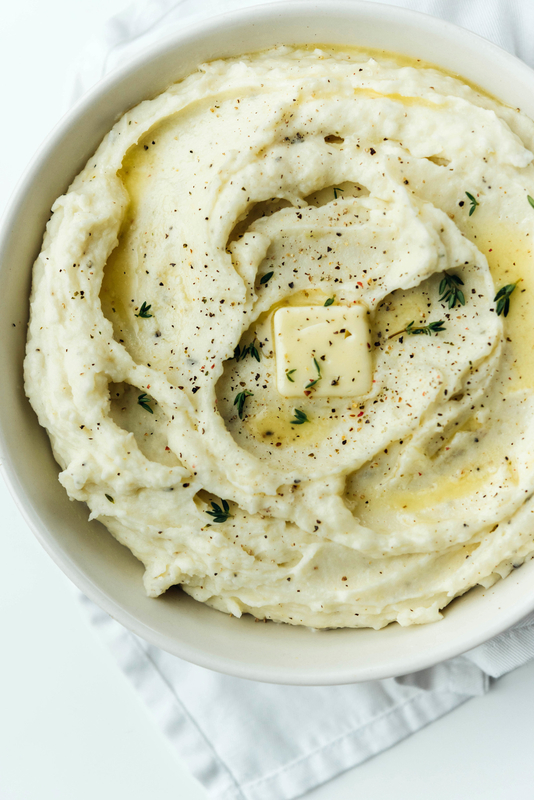 • Light and Fluffy Mashed Potatoes: AKA the classic, fluffy mashed potatoes seen on just about every Thanksgiving table. These babies are simple, buttery, and 100% smooth. If you're looking for a safe crowd-pleaser, this is your recipe. • Chunky, Skin-On Mashed Potatoes: These are for people who like their potatoes with a bit of texture. It's made with small red potatoes, with their skin still on, to produce a seriously chunky mash. • "Not-Too-Dense" Mashed Sweet Potatoes: Sure, mashed sweet potatoes are delicious, but they can also be pretty dense. 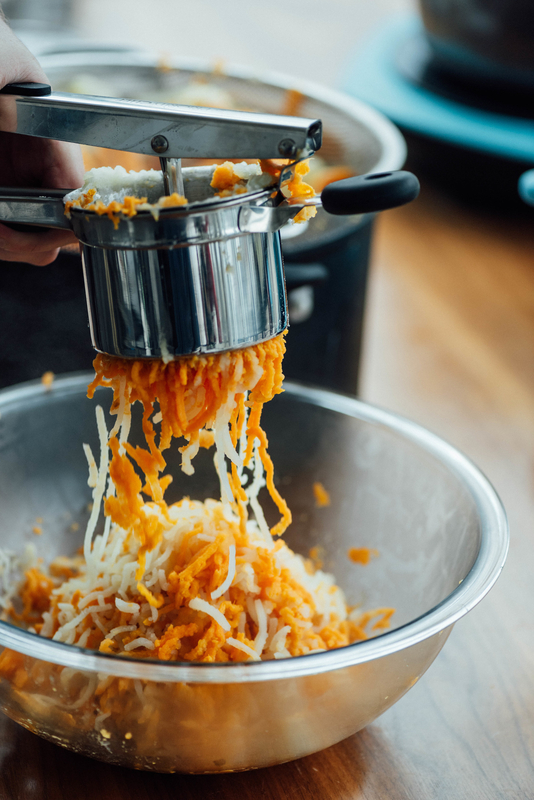 We went on a mission to create a sweet potato mash that wasn't too heavy, and we think we aced it with a little help from a secret ingredient. • Ultra Creamy Mashed Potatoes: These potatoes are for the over-achievers; the people who watch Food Network and love trying new things. They're super creamy, decadent, and infused with savory garlic and herbs. The trick? Cooking them in the cream. Trust us, you'll love 'em. • Waxy Potatoes: Waxy potatoes (such as red bliss and new potatoes) are creamy and flavorful. The flesh is buttery, yellow, and holds it's shape well after cooking. 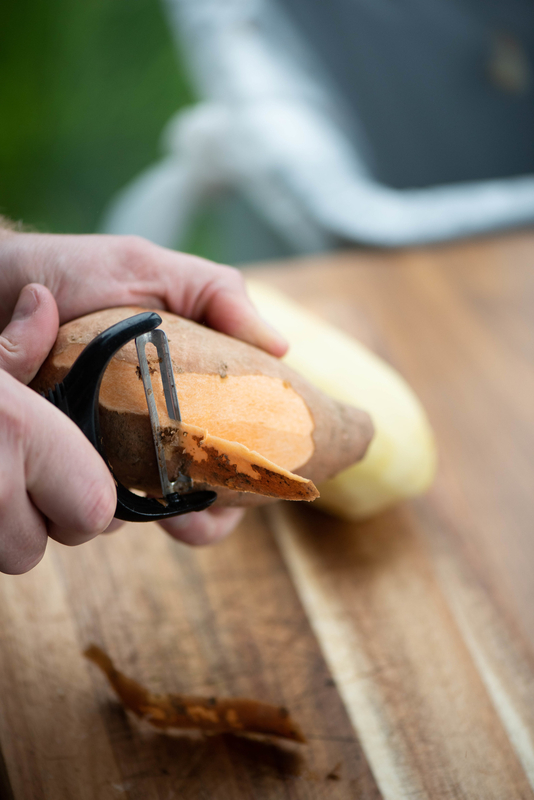 Because they're firm, they aren't going to break down and become super smooth after cooking like Russet potatoes do. These babies are all about flavor, but lack on the texture front. • Starchy Potatoes: Starchy potatoes (like russets, Idaho potatoes, or chef's potatoes) will give you the fluffiest, smoothest mash. They fall apart easily and absorb butter and cream well. When you think of the iconic white, creamy mashed potatoes, it's made with these. The only downside is that these potatoes lack flavor. • Sweet Potatoes: Everyone is familiar with sweet potatoes. They're sweet (duh! ), full of flavor, but very dense. They can be a bit of a challenge to make mashed potatoes with, as their heavy texture often produces a mash that is way too dense. • Potato Ricers: The first is a potato ricer ($18.95 on Amazon). These babies are great for making mashed potatoes that are super smooth, fluffy, and completely lump-free. 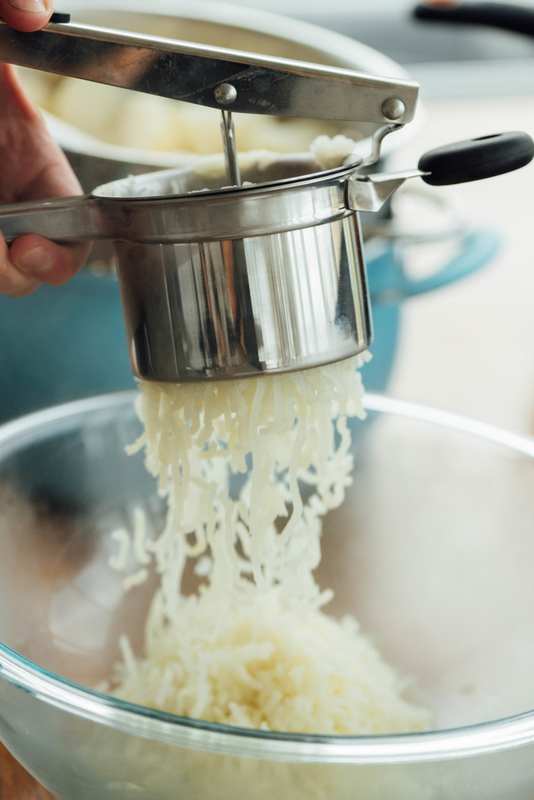 You just load the cooked potatoes into the ricer, press down, and out come super silky mashed potatoes. • Hand Mashers: The other variety is a classic hand masher ($11.99 on Amazon). These take a bit more work and won't give you perfectly smooth mashed potatoes. They're great for people who want to keep a bit of texture in their mash. You can find full recipes at the very bottom of this post and step-by-steps below. If you're hosting a large group of people, this is a safe bet and super easy to prepare. 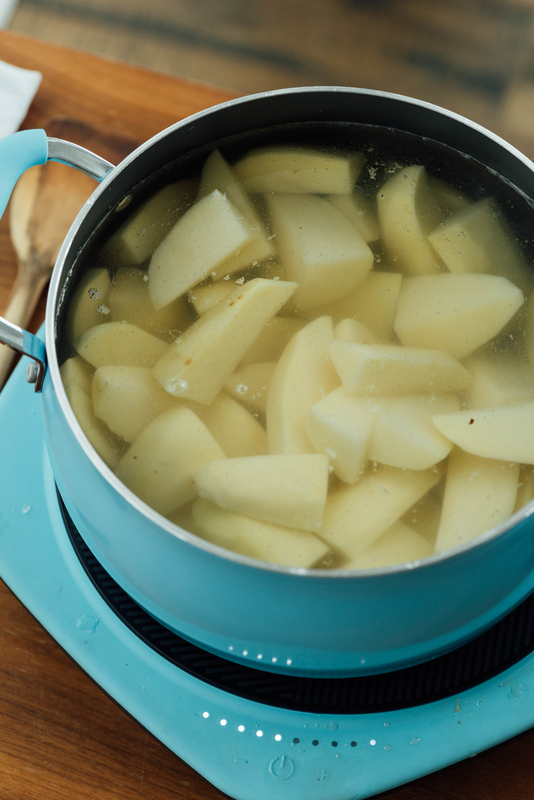 Start by cooking large chunks of peeled russet potatoes in heavily salted water. Russets are used for this recipe to give it a super smooth texture. For all of the recipes, we will be starting them in cold water with a tablespoon of salt. This is so the potatoes cook evenly and don't end up mushy on the outside. 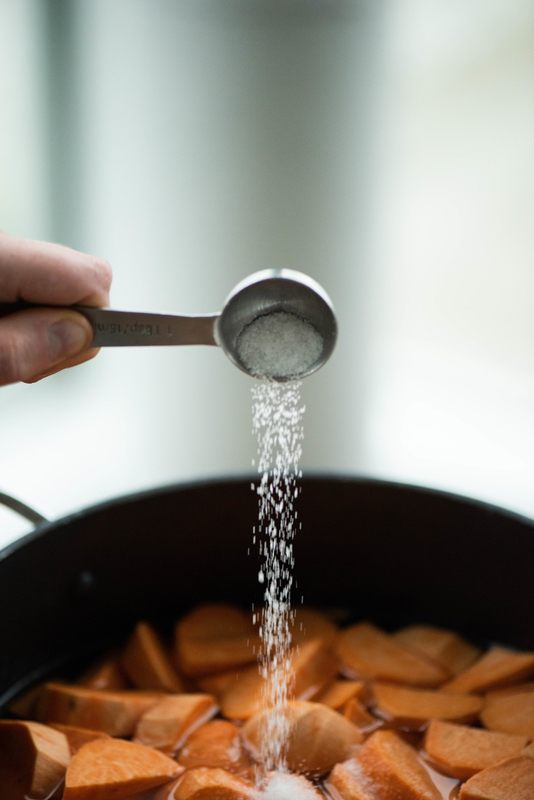 The salt may seem like a lot, but it seasons the potatoes as they cook and most of it will go down the drain anyways. 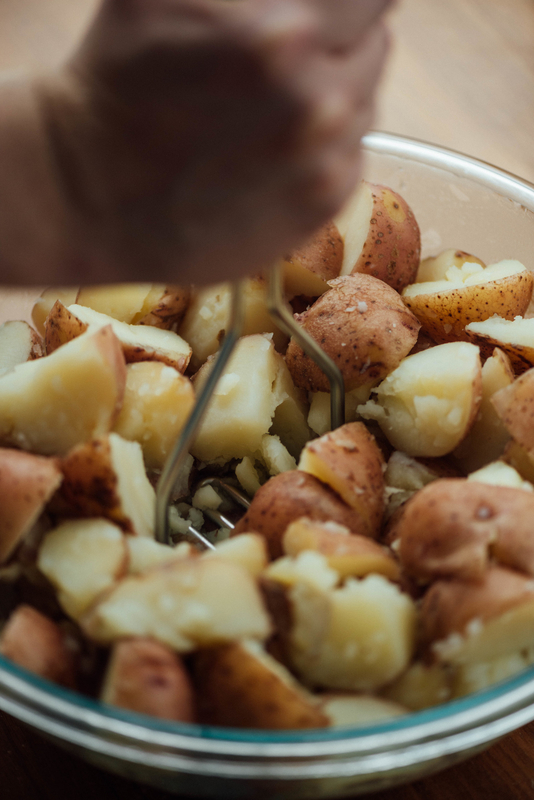 Once the potatoes are tender and can easily be pierced with a fork, drain them in a colander and push them through a potato ricer while they're still hot. This will ensure that the mash is completely smooth and lump-free. 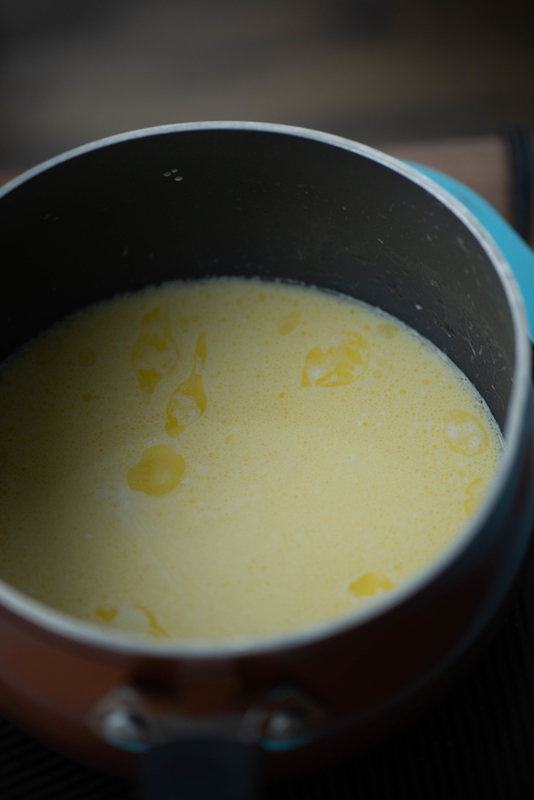 Then heat some cream, milk, and butter in a small pot until simmering. Pour the mixture over the riced potatoes, and stir until they absorb the cream mixture. Season with a generous amount of salt and pepper, then serve with additional butter and chopped chives if you're feeling fancy. • Good for: Large groups, traditionalists, and people looking for a low-effort side. • Bad for: Texture lovers, people looking for something a little more adventurous. This version tastes like loaded baked potatoes and is perfect for people who don't like their mashes completely smooth. And remember, you can always mash the potatoes a bit longer, or less, to adjust the ~ chunkiness ~ to your liking. *Why red bliss? Because they're buttery, full of flavor, and hold their shape well. You could also use Yukon gold potatoes, but they may end up a tad bit creamier. Then heat some cream, milk, butter, and minced garlic in a small pot until simmering. The garlic will give these babies a subtle, savory flavor, but you can leave it out. 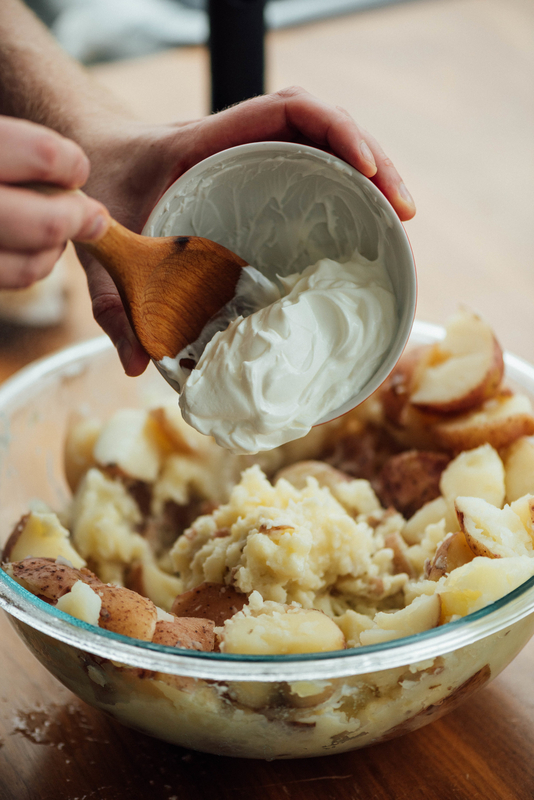 Pour the cream mixture over the smashed potatoes and add half a cup of sour cream. This will help keep the potatoes light while still remaining chunky. Then just season with a generous amount of salt and pepper and serve with sliced scallions and additional butter to play up the loaded baked potato vibe you got going on. • Good for: People looking for something new, texture lovers, and loaded baked potato enthusiasts. • Bad for: Traditionalists and people looking for a classic, fluffy mashed potato recipe. 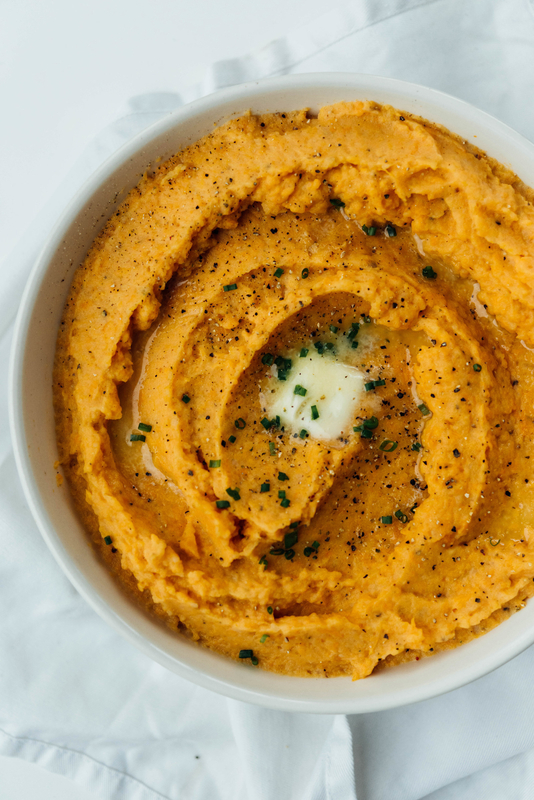 Your classic mashed sweet potatoes you know and love with a little trick to make 'em lighter and less dense. Start by placing peeled and chopped sweet and russet potatoes (!) in a large pot of cold water. The russet potatoes will help keep the mash nice and light without changing the color or flavor all that much. Cook 'em until fork tender, then drain and transfer them into a large bowl. The russet potatoes may look like they're slightly overcooked, but fear not! 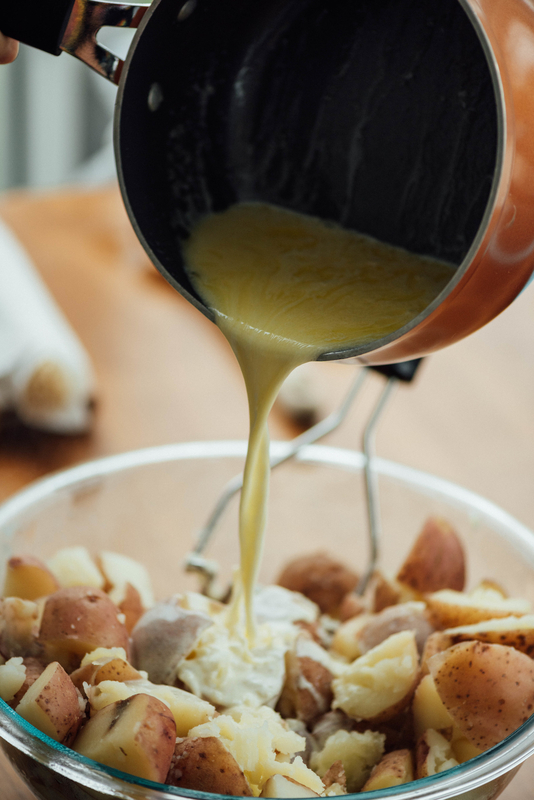 Heat some cream, milk, and butter in a small pot until simmering, and pour over the potatoes. Mash 'em until smooth, and season with pepper and a generous amount of salt — a tad more than usual to balance the sweetness. After all, these are not dessert potatoes. Then just serve with extra butter and chives to add even more savoriness. • Good for: People who love sweet potatoes but don't like them too dense or loaded with brown sugar. • Bad for: People who are used to their sweet potato sides tasting super sweet and topped with marshmallows. Think of these as the premium mashed potatoes you'd be served at a fancy restaurant. The kind you make when you have to impress your in-laws or foodie friends. Start by peeling and cutting russet potatoes into large chunks and placing them into a pot. Russets will make this mash smooth, smooth, smooth! Cover the potatoes with milk and cream (!) and add some rosemary, thyme, and crushed garlic. Brace yourself, because we are going to be cooking the potatoes in the cream. This will not only infuse them with a ton of flavor, but it'll make them super creamy. 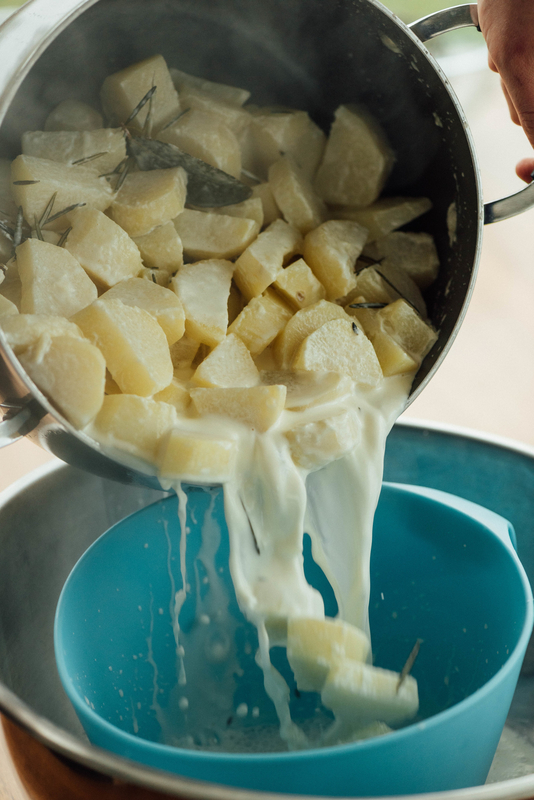 Once tender, strain the potatoes, saving the liquid, and smash them with butter and just enough of the cooking liquid to make them nice and creamy. Then just season with salt and pepper, and that's it! 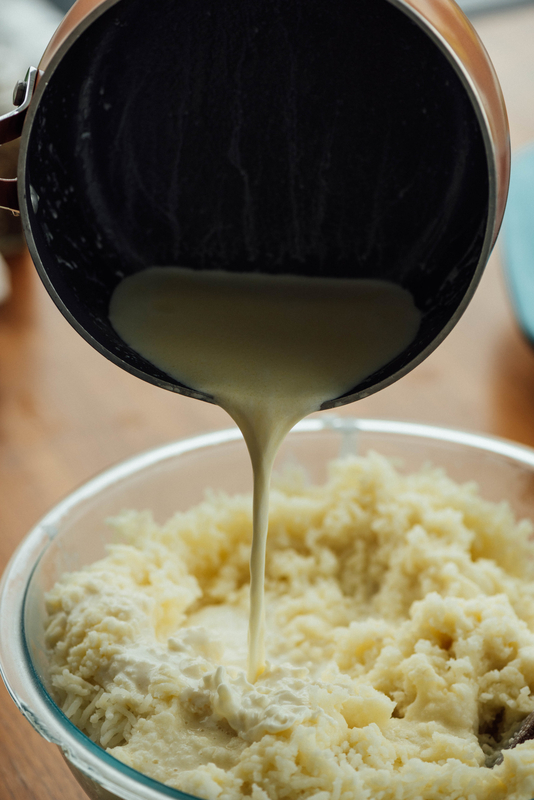 Any extra cooking liquid can be saved to rehydrate any leftover mashed potatoes the next day — because we all know how dry and hard leftover mashed potatoes can get. • Good for: Cheffy types, people who are truly looking for the ultimate mashed potatoes, and overachievers. • Bad for: People avoiding excess dairy or people in a rush to get food on the table. So there you have it: Mashed potatoes that'll please everyone. Pick the one your family will love and get cooking — or cook multiple if you're feeling ambitious! 1. Place the potatoes in a large pot and cover with cold water. Add the salt. 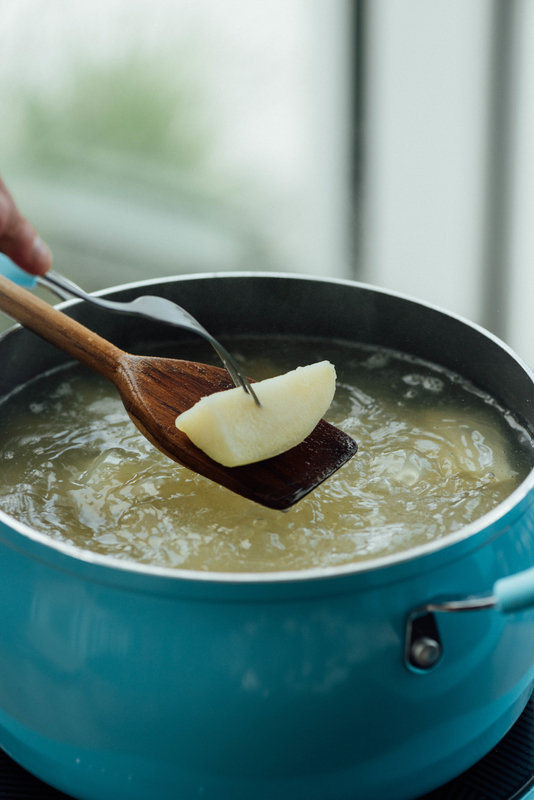 Bring water to a boil over high heat and cook until potatoes are fork-tender, about 20 minutes longer. 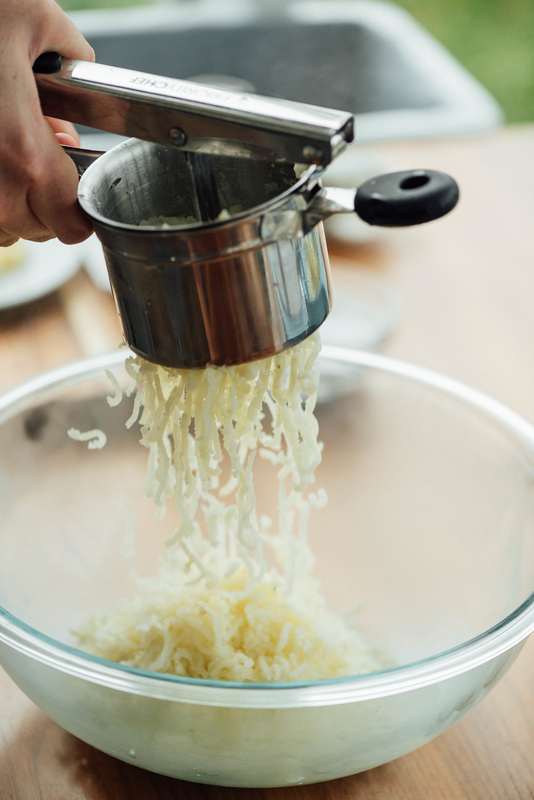 Drain and press through a potato ricer into a large bowl. Set aside. 2. 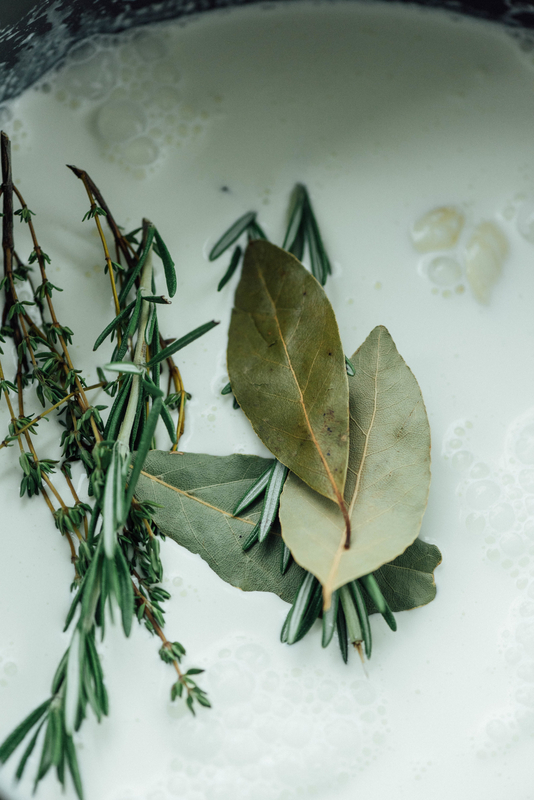 Heat the cream, milk, and butter in a small pot over low heat until simmering. Pour over the potatoes and stir to combine. Season to taste with salt and pepper. Serve with chives and additional butter if desired. 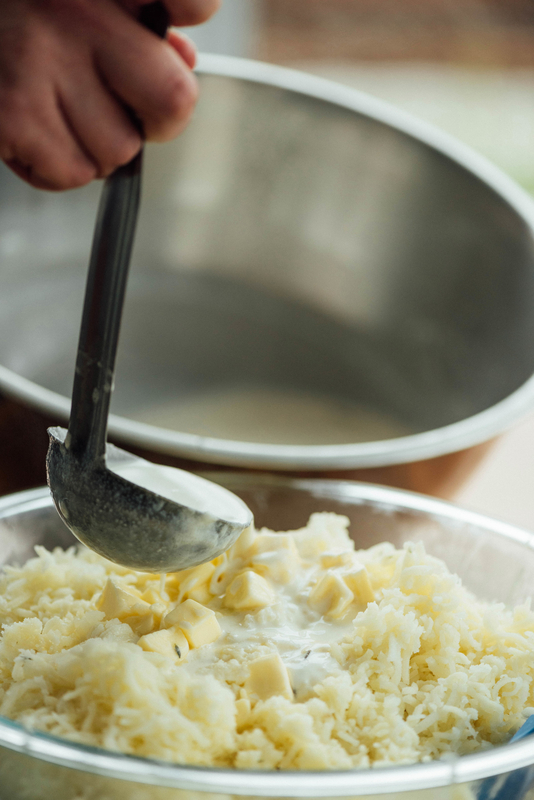 Note: A potato ricer gives these potatoes a super fluffy texture, but you can use a hand masher if you don’t own one. 1. Place the potatoes in a large pot and cover with cold water. Add the salt. 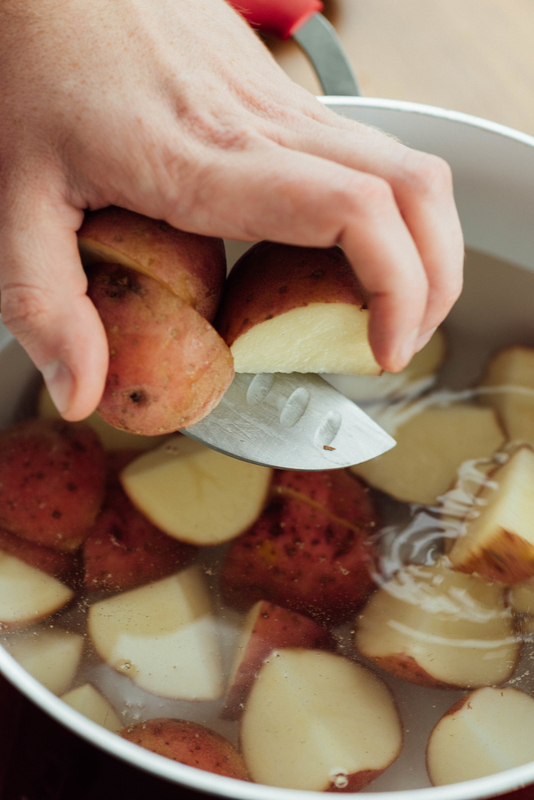 Bring water to a boil over high heat and cook until potatoes are fork-tender, about 20 minutes longer. Drain and return to the pot. Set aside. 2. Heat the cream, butter, and garlic in a small pot over medium heat until simmering. Pour over the potatoes. 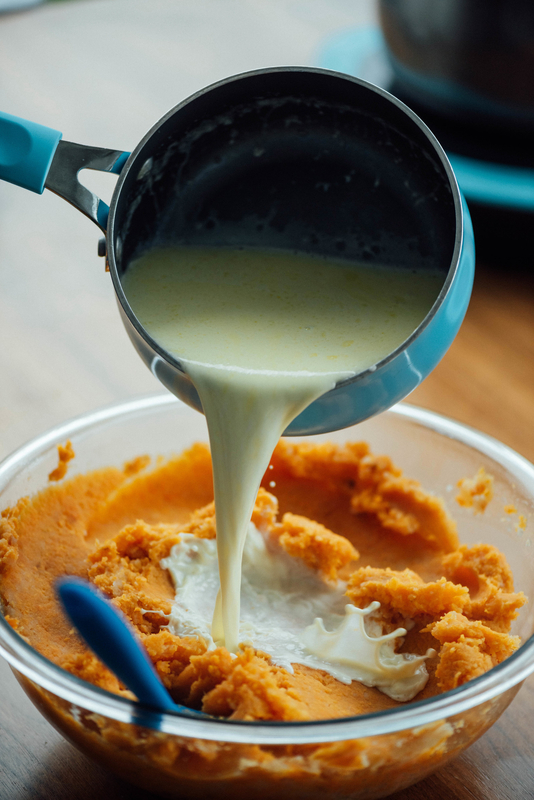 Add the sour cream and mash using a hand masher until the potatoes are creamy, but still very chunky. Season to taste with salt and pepper. Serve with green onions and additional butter if desired. Note: Any small waxy potato would work well in this recipe — such as Yukon golds or new potatoes. 1. 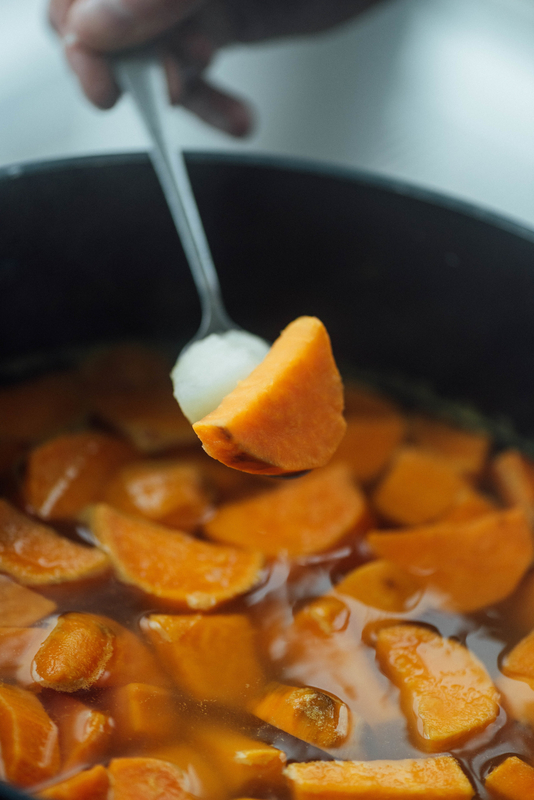 Place the sweet potatoes and potatoes in a large pot and cover with cold water. Add the salt. Bring water to a boil over high heat and cook until potatoes are fork-tender, about 20 minutes longer. Drain and transfer the potatoes to a large bowl. Set aside. 3. 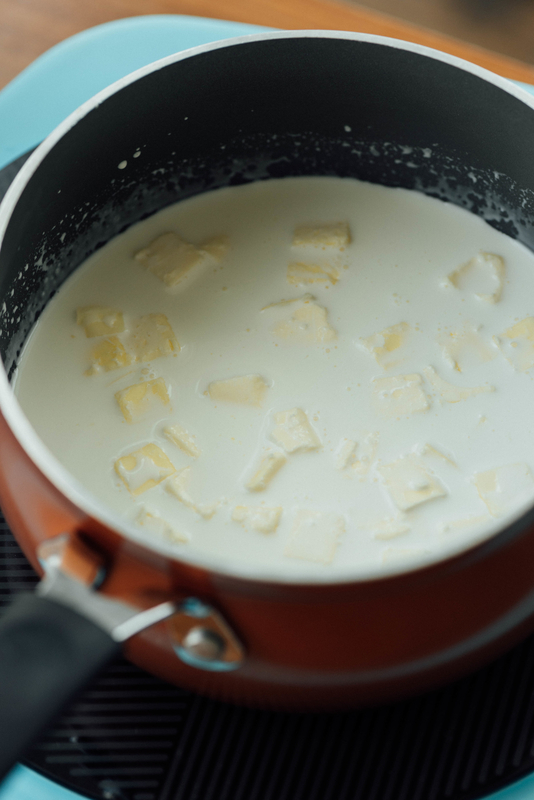 Heat the cream, milk, and butter in a small pot over low heat until simmering. Pour over the potatoes and mash with a hand masher until smooth. Season to taste with salt and pepper. Serve with additional butter and chives if desired. Note: Russet potatoes gives these a lighter texture compared your typical sweet potato mash, but you can swap them out with two additional pounds of sweet potatoes if you’d prefer to keep it classic. 1. Place the potatoes, garlic, bay leaves, rosemary, and thyme in a large pot. 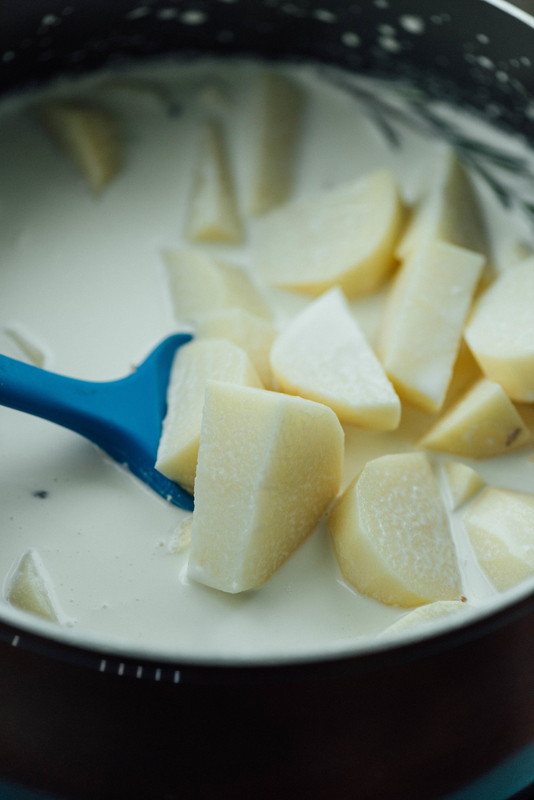 Pour the cream and milk over the top and cook over medium heat until the potatoes are fork-tender, about 20 minutes. 2. Strain the potatoes, reserving the cooking liquid, and discard the herbs and garlic. Press the potatoes through a potato ricer into a large bowl. 3. Add the reserved cooking liquid, ¼ cup at a time, and stir until the potatoes are creamy. You will not need to use all of the liquid — 1-1½ cups should be enough. Season to taste with salt and pepper and garnish with additional butter and thyme if desired. Note: You can save any extra cooking liquid and use it to rehydrate any leftover mashed potatoes the next day.